Further, with this single e-way bill, the goods can be transported from one state to another without any hindrance. Registration for GST E-Way Bill Services only open for Karnataka Dealers. gst.kar.nic.in is the central tax website link from where the supplier, receiver or transporter can generate e-waybill for the movement of goods across India. In other words, if you want to generate the e-way bill, then you need to first register on the website and then only you can proceed for e-waybill generation. Supplier: The Supplier can register and generate e-way bills after registering on the website. Further, they also have the power to reject, if e-way bill does not belong to him. Recipients: The recipient to has the power to register and generate an e-way bill from gst.kar.nic.in. Further, he also has the power to reject the e-way bill. Transporter: He can generate the e-way bills under GST and he can further update the vehicle numbers for the e-way bills assigned to him for transportation by the taxpayers. Department officers: The department shall verify the e-way bills and consignment carried with the e-way bills. After that, the user shall be redirected to E-way bill registration form. The registered person shall need to enter GSTIN number and enter the captcha code and then click on go. Once request is submitted, the user shall be redirected to another page, where other details are required to be fulfilled. After entering all the information, you must submit and verify the same by using OTP which is sent to the registered taxable person. Once the details are submitted, the account gets created and then we can proceed to next step. Masters – where you can create items, customers, products etc. Let us move to next step which explains about the new e-way bill. Once you are logged in into the system, you need to select the ‘generate e-way bill’ and after that, you need to select ‘E-way bill’. Further, keep the invoice or bill of supply and transporter ID ready to fill all the required details to generate the new e-way bill. You need to select the type of transaction, i.e. sales or purchase. Once the type of transaction is selected, you need to choose types of document i.e. tax invoice, bill of supply or delivery challan. If you are generating an E-way bill for outward supply, then enter name and GSTIN for the consignee. After that, you need to enter items details. Further, details of items shall be auto populated, if the item has been created from the masters (option on the homepage after logging in). After completing the step 3, the user shall select the mode of transportation like by road, air, rail etc. If a user is carrying out the transportation through the third party, then he /she will generate the E-way bill by entering the transporter id and transporter document number and date given by the transporter. Once the transport ID is selected, the generated e-way bill shall be forwarded to the concerned transporter, and then the transporter shall enter vehicle number. Once the request has been submitted by the user, the system shall verify the details automatically and shows a message, if there is any error. Further, if all the details are correct, then e-way bill be generated through form EWB – 01 containing the 12 digits unique number. 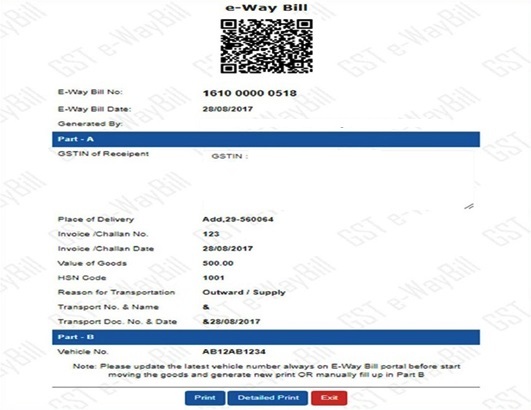 You can see and refer how the final copy of e-way bill is generated. you will have to add a 0 after DL to make it DL01LM8548.